As we have written previously on this wedding photography website, we love taking pictures of the interactions between Washington, DC, area brides and their fathers. Every bride has a lot of important relationships in her life, whether we are talking about the one with her mother, with her sister(s), with her cousin(s) or her friends, and finding ways to use our photographs to highlight the feelings she has toward those people is a critical part of the work we do documenting a marriage celebration on film. As beautiful as those interactions are, however, we almost always find the father-daughter relationship to be something special. Every family is a little different, of course, but most of the brides that we have had the pleasure of photographing on their wedding day have been very close to their dads, and as a result, some of the sweetest and most touching moments that we have captured on film occur when the bride’s father walks his little girl down the aisle and when the two share a dance together during the wedding reception. Both traditions are beautiful ways for the father of the bride to bid a metaphorical goodbye to his little girl and to say hello to a young, independent, grown woman who has taken her place. The father-daughter relationship is so special and its significance is so apparent on a wedding day that many of the other women present at the nuptial celebration get caught up in the moments themselves. We have taken many pictures of bridesmaids with tears streaming down their cheeks as they watch their sister/cousin/friend takes a turn around the dance floor with her dad. Imagining themselves sharing a special moment like that with their own fathers is sometimes overwhelming for them. The reaction of the bridesmaids in this particular image was a little different, but we love it just as much as those other pictures. We took the photograph at the luxuriously swanky Metropolitan Club, an exclusive wedding venue in downtown Washington, DC, and one of our favorite places to take pictures of nuptials. As the bride and her father finished their dance and embraced each other, the young woman standing just behind them was yelling and cheering them on. She is clearly so happy for her friend and everything that she is experiencing on her wedding day. Her excitement is boiling over, and she cannot help but shout with joy at the conclusion of one of the highlights of the marriage celebration. 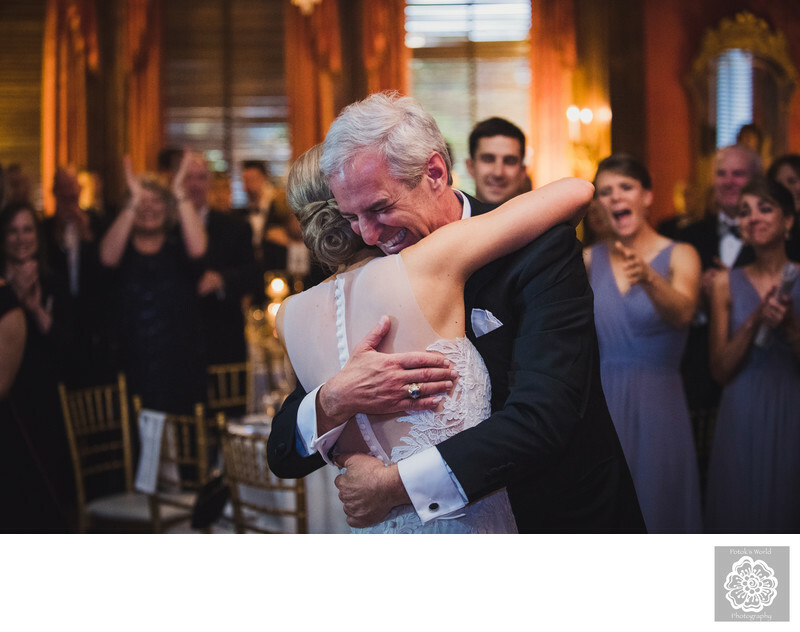 In our opinion as professional wedding photographers based in the Washington, DC, metro area, the best part of this picture is the way that the bridesmaid’s reaction reflects the emotions written on the face of the father of the bride. Some father-daughter dances are sentimental moments that end with both parties in tears. Others, like this one, are more lighthearted, happy and fun. Like the bridesmaid, this father of the bride is just so overjoyed that his little girl is having the wedding of her dreams and has found the man with whom she wants to spend the rest of her life.